Claiming joint honours as the third highest mountain in Japan, Ainodake is regularly climbed in concert with Kita-dake and Notoridake. Together these trio of mountains in the northern Minami Alps are called the Shirane-sanzan “three white summits”. 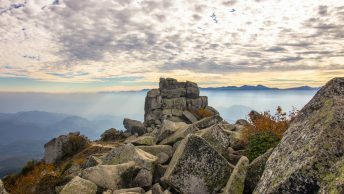 If you have previously climbed Kita-dake you’ll be pleased to read this lesser used route to Ainodake steers away from the tried and tested path from Hirogawara. Not easier but far less crowded. For fastpacking this trip could be condensed into two days by overnighting at the Notori hut which marks the approximate half way point. 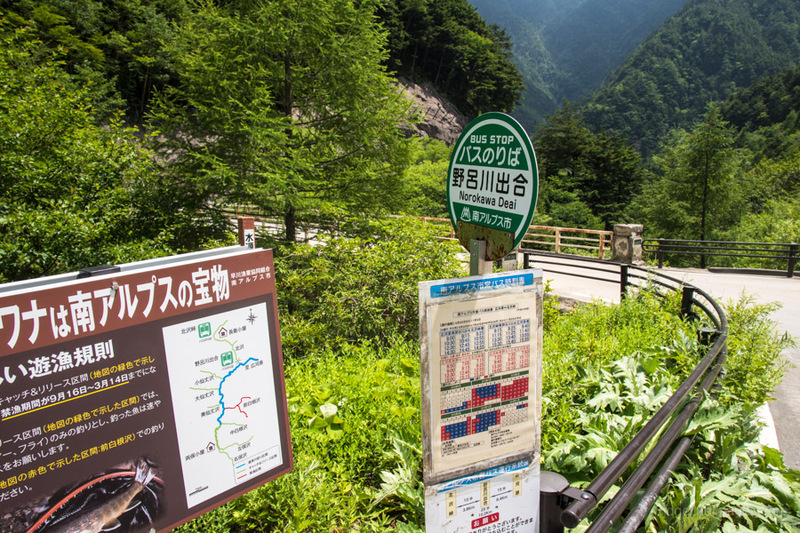 Accessing the trail head is the same as for the Kita-dake 北岳 hike except you need to change buses at Hirogawara. Depending on the time of day expect to wait anywhere from 30 minutes to 1 hour for a connecting bus. Drop off your pack in the waiting line before heading over to the ticket office. The bus to Norogawa deai (15 mins, 800 yen) would have to be one of the more expensive bus rides in Japan. I was also the only person to get off much to the chagrin of the bus driver who had to shuffle around some passengers, so I could exit. The first 20 minutes of the hike wasn’t so pleasant with a steady progression of dump trucks kicking up dust. Once past this point the forestry road gains a little elevation as it shadows above the Norogawa River. From the bus stop to the Ryomata hut 両俣小屋 takes around two and half hours. The campsite (500 yen) has an idyllic setting and sits squarely at 2,000 metres. After setting up my tent I headed straight for the river for a refreshing dip. Suprisingly for a Friday night in mid-July there were only a handful of tents. The thing I enjoy about hiking in the summer is getting up early. 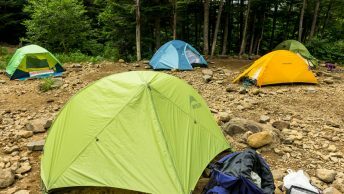 If the sun doesn’t rouse you from slumber than your fellow campers certainly will so no need for alarms. By 5:30 am I had eaten breakfast, packed up and was back on the trail. The mornings first goal is hiking up to Norogawagoe 野呂川越 which with fresh legs should take a little under an hour to reach. After taking a short breather, steel yourself for a rather long and sustained climb up to Mt. Mibudake 三峰岳 (2,999 m). The trail starts off flat enough but steepens towards the end where there is a small rock ledge that you need to negotiate but shouldn’t pose a problem. Give yourself a pat on the back as from the campsite you’ve just ascended one metre shy of 1 km. Staring in front of you is Mt. Ainodake 間ノ岳 (3,189 m) the third highest peak in Japan alongside Mt. Hotakadake. 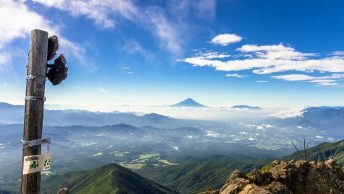 Thankfully most of the hard work is behind you and it should only take 50 minutes to get up to its wide mountaintop which straddles Yamanashi and Shizuoka prefectures. Fine weather affords a wonderful view of Mt. Fuji and lengthways along the Southern Alps. After grabbing your summit pics, start heading down to the red roofed Notori hut 農鳥小屋 which you probably caught a glimpse of on your way up. The route is easy to follow with ever-present painted rocks signalling the best course. A slight drawback of this hut is the 30-minute round trip to the waterhole. I suggest bringing along an extra collapsible water carrier solely for this purpose as you won’t want to do it twice. The hut’s proprietor is also quite the character, with a reputation for being irascible with guests arriving late for dinner, it’s probably wise to keep on his good side. The advantage of showing up just after midday was finding a sheltered spot to pitch my tent (1,000 yen) which also provided some welcome shade. By daybreak the previous day’s cloud had faded setting the stage for some of best weather you could hope for. Suffering the aftereffects of mildly sunburnt hands, I wasted little time scoffing down breakfast and breaking camp with another hot day forecasted. From Notori hut the trail steepens pretty much from the get-go though traces a course around the right shoulder making it somewhat easier. Mt. Nishinotoridake 西農鳥岳 (3,051 m) was soon reached and managed to chase down the first of several large hiking parties. The traverse across to Mt. Notoridake 農鳥岳 (3,025 m) takes about the same amount of time with some occasional rock scrambling. Mt. Notoridake is the southernmost mountain of the Shirane-sanzan though is relegated to the 200 famous mountain list. The mountain gets its name from a snow shaped like swan that materialises on the easternside of the summit in late June. This marks the final high point of the hike with a moderate loss in elevation as you head down to the Daimonzawa descent point 大門沢下降点. The yellow metal structure you find here complete with a distress bell is in fact a memorial. It was erected by the bereaved family of a young man who found himself here in midwinter and being unable to locate the descent point ended up dying of exposure. From here on the trail takes-no-prisoners approach as you rapidly drop in elevation. Ropes are judiciously fixed in areas where the trail is washed out but either way for the next two and a half hours it’s rather punishing on the legs. And did I mention it was hot. After arriving at the Daimonzawa hut 大門沢小屋 it was a relief to find some shaded sites. The campsite (500 yen) is positioned at the rear of the hut which cuts down on noise and is oriented in the direction of Fuji san a nice bonus at sunrise. With the second morning bus back to Hirogawara departing a bit after 9:00 am (45 mins, 1,030 yen) I decided to take it easy and leave the campsite sometime before 6:00 am. The trail from the hut down to the river had suffered some recent landslide damage that required the help of a rope. On this final part of the hike back to the First Narada Power Station Bus Stop 奈良田第一発電所 you will need to make no less than four river crossings. Some have ropes to balance your footing at other crossings just take it carefully. After crossing a minor mountain pass the trail enters an area of steep, tightly laced switchbacks which demands your full attention. Otherwise it’s a nice finish to what is awesome hike in the Southern Alps. Thank you David. Keeps me inspired to get back there – one of the prettiest places on the planet presenting in perfect summer conditions. It is, isn’t it. The fine weather of course helps but the Southern Alps have an innate majesty which set them apart and at least for the time being see fewer hikers than the N.Alps. I can’t see the comparative numbers (vis a vis Northern Alps) changing significantly for the key reasons of no massive infrastructure (the Murodo extravaganza), or the general four season and winter skiing tourism facilities that bring in such big numbers to much of the Northern Alps with its well grooved access. My best Southern Alps trips were in June, walking in from Yashajin toge (the point where the road is closed) and almost having the mountains to myself.